Many of you have asked if the Republican National Committee is supporting our minority candidates in their effort to win in November. Regardless of what you may have heard let me say, YES they are! The Republican Party has developed a comprehensive strategy to win the minority vote which I feel is critical to our survival as a party. By going directly to the RNC and speaking to those in charge of the effort I am able to share the following first hand information with you. Manny Rosales, Deputy Director of Coalitions from the Republican National Committee was the person to see. On our trip to Washington DC in August my husband Bill and I accepted his invitation to visit him at the RNC Headquarters. Manny, an American citizen born in Nicaragua, is part of the team effort that mobilizes and trains Republican advocates and supporters through different programs which include the ‘Say it Loud’. This program encourages grassroots supporters to use their voices and does a great job on the use of the new media. We found him to be a gracious host and eager to give us a personalized tour of the RNC Headquarters. 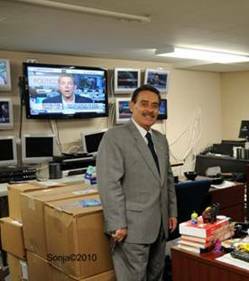 Manny pointed out the various rooms and what was accomplished by the people occupying these offices. The first area was the Press Room just to the right as you walk in the building. This is where all the news conferences are held. It is a rather classy looking room with the podium in the front where Chairman Michael Steel can address the journalists asking their questions. 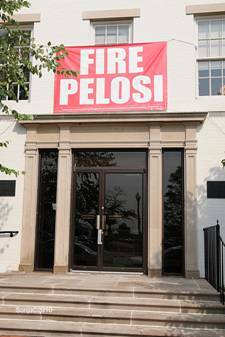 A replica of the Tour Bus with ‘Fire Pelosi’ was in full display. If you would like to see where the Bus Tour is heading I have enclosed a link to the website. The other item that caught my eye was a collection of ‘old’ political buttons that were displayed in a case on the left wall. Of course I would notice this as I also collect vintage political buttons. Manny then took us up the elevator to the other intriguing ‘rooms’. The Research Center is the place where investigations take place to either dispel lies or confirm the truth about different current issues. We entered The War Room, the Communications Department, and the Phone Bank where calls promoting Republican candidates take place to all parts of the United States. 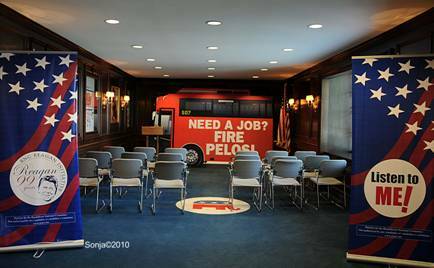 Then there was the Training Center where grassroots people come from all over America to learn about Republican issues and how to promote our cause. 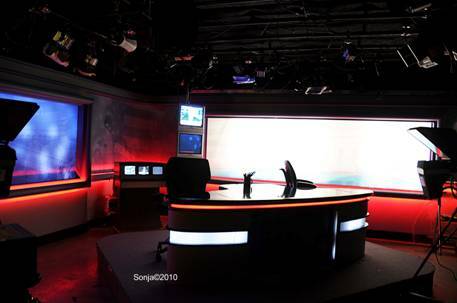 One of my favorites was the TV studio. This set is where Michael Steel makes his announcements before the camera. It was a totally impressive tour. Manny introduced us to Angela Sailor his boss, the Coalitions Director. She was friendly, informative and explained how busy she and her staff were working to elect minority candidates throughout the United States. 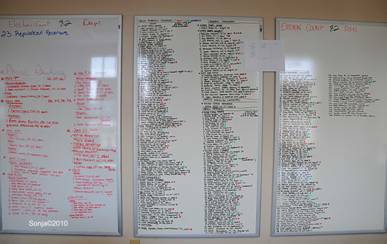 There in front of her desk were three huge white boards with the names of all candidates aspiring to be elected. The winners and losers of the recent primaries were all there. 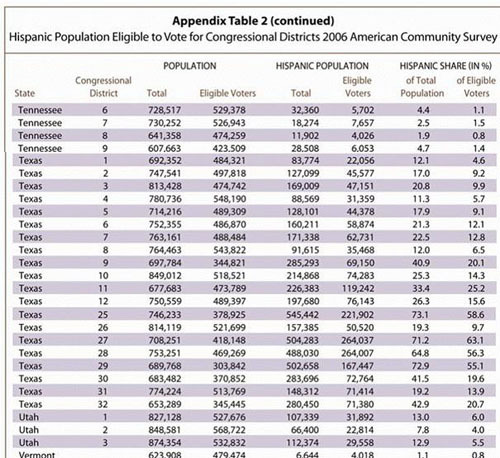 Hispanic candidates Francisco Canseco, District 23, Bill Flores, District 17, Roy Morales, District 29 and African American Stephen Broden, District 30 from Texas are at the top of the lists. She and her staff are focused on the primaries in order to give further support to the winning candidates in the general November election. 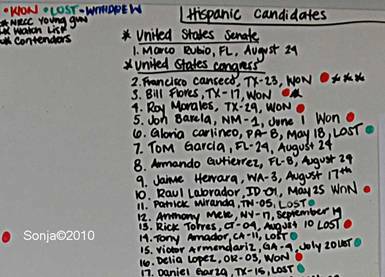 As you can see the white boards list some of the Texas and other state candidates who are being supported by the RNC. After our tour I sat down with Manny to discuss the very hot and serious topic of getting Hispanic Americans to vote Republican. Some cases are difficult he said because of their age and language barrier and the information they receive via the Spanish speaking TV and radio stations which are LEFT leaning. It is much easier to reach the younger and educated Hispanic American because he is most apt to listen and receive information like the rest of America through the MSM. Manny told me that “most Hispanics are Republican they just do not know it.” That is why we must address issues when explaining who we are and not bring up party affiliation. Most Hispanics are conservative but do not equate being Republican with being conservative. It is up to us to develop a relationship with the Hispanic community in order to gain their trust. At present the ratio of Hispanic voters is 20% Independent, 20% Republican and 60% Democrat, which may seem overwhelming. But we can overcome this by concentrating on our message of conservative values, and topics that concern and affect all of us, education, jobs, the economy and the freedom to do what we want to do. Social issues such as abortion and marriage between a man and a woman are conservative issues which Hispanics embrace and which match with conservative Republicans. 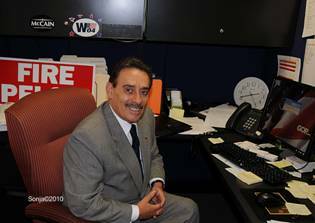 Manny also mentioned that Hispanics were very entrepreneurial and industrious. There are 50,000 Hispanics turning 18 years of age each month in America and this trend will continue for the next decade. We must find a way to develop and earn the trust in the Hispanic communities so that our message will lead them to the Republican Party. Otherwise the Democrat Party will continue to entice them and lead them down the path to being Socialist/Liberal Americans. Manny could not stress enough how critical local and state politics are in gaining the Hispanic communities. He also reminded me that Obama has NOT given the Hispanic community what he promised, Immigration Reform. This is a key issue in our battle for the Hispanic vote. Hispanics are the most rapidly growing group in the nation. In fact, if current immigration and birthrate trends continue, Hispanics will become America's largest ethnic group during the next century. Constituting fifteen percent of the population already, they're poised to become twenty-nine percent by 2050. This is relevant because, while many rationalize away the reality, a majority of Hispanics oppose tighter border control. For example, one survey showed that 81 percent of Latinos in Arizona oppose their state's new immigration law, with 70 percent registering strong disapproval. Because of this, many have warned Republicans against "alienating" this burgeoning voting bloc. For instance, Simon Rosenberg, the head of a group that studies such matters, said, "If the Republicans don't make their peace with Hispanic voters, they're not going to win presidential elections anymore. The math just isn't there." Immigrants are often more willing to take the risk of using their savings to launch a business, he said, hence the huge number of new immigrant-owned businesses. "When you come here as an immigrant, you are taking a chance, and that is what starting a business is all about," Zajur said.